Every summer, locals anticipate the Rocky Mountain Folks Festival, which is a time for them to unwind and relax on an August weekend. The long-running event has remained true to its vision in giving a fun summer event filled with music and stories. So grab a spot, spread out your blanket or plant your chair near the concert stage because this is one music festival that you shouldn’t miss. The Rocky Mountain Folks Festival will celebrate their 29th year on August 16th to 18th, 2019 at the Planet Bluegrass Ranch in Lyons. Bring along your friends, family, and kids for a memorable summer concert weekend. It’s the “summit on the song”! 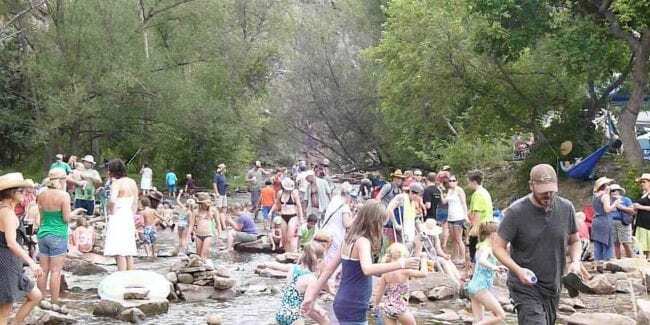 Bring your bathing suit if you plan on splashing around in the North Saint Vrain Creek.